After reading and loving yet another Dreamspinner Press Advent Calendar story by TJ Nichols this past December, I vowed to myself that I was going to read more of the author’s work this year. I’m only slightly ashamed to say that this was my primary reason for picking up Lust and Other Drugs because, for some reason unknown to myself, I don’t tend to read much fantasy (MM or MF), even though I almost always enjoy it when I do. But I didn’t just enjoy this novel, I devoured it. In the world Nichols has created, scientists caused the collapse of the barrier between two worlds – the world as humanity knew it and the world of Tariko, where the beings believed to exist only in our myths and stories actually lived. Despite the passage of a decade, human and mytho relations are… well, strained isn’t even a strong enough word. True to their species’ fear of the unknown, humans treat mythos as less than, with few countries even allowing them rights and some going so far as to allow the hunting of mytho without consequence. Unsurprisingly, there are factions in the US who lash out at mytho, comparing them to animals and feeling justified in their hatred and mistreatment of them. As a police officer in San Francisco, Jordan finds his loyalties tested as he’s tossed into the job of police liaison to mythos in cooperation with Mythological Services. Growing up gay in Texas, Jordan knows what it’s like to be mistreated for being different, so he has a better understanding of what mytho face when targeted by criminals. And this adds to his frustration when he’s prevented from doing his job by both his brothers in blue and the mythos, who have ten years’ worth of reasons to mistrust the police. Further complicating his ability to do his job is the attraction Jordan feels toward Edra, the mytho he’s been assigned to liaise with. With the upcoming mayoral election, San Francisco is a powder keg about to blow, an explosion Jordan has found himself right in the middle of. After all, what’s a boy to do when the only man to light his fire in years is a dragon? I was absolutely fascinated by the world Nichols has created. The collision of the human world with the mythological world had me wishing I could remember more of the stories I read as a teen so I could better suss out what was long-held mythology and what was the author’s take on the various creatures. I’ll admit, I was a tad bit taken aback when Edra went invisible because it’s not an ability I recall being associated with dragons or shifters, but it was freaking cool! There are a couple of unexpected touches Nichols added to Jordan and Edra that I loved but won’t mention because readers should get to find those tidbits out for themselves, especially as they contribute in part to how their potential relationship is beginning to play out – and the sexiness factor. Of course, I just limited my ability to discuss the specifics, but I will say that the romance isn’t the primary focus of this installment. Because of how poorly mythos have been treated since being forced into the human world, Jordan has to prove himself to Edra before an actual relationship can begin, so the story is more focused on solving the murders of both mythos and humans and it makes for an engaging, exciting, and often frustrating ride – I know there was more than one human I wanted to feed to the dragons or toss to the mermaids. Yep, I would definitely be a mytho sympathizer in Nichols’ San Francisco. On a final note, there is a bit of a cliffhanger at the end. Personally, I love cliffhangers and Nichols has, in my opinion, struck the right balance of resolution for some issues and unanswered questions for others. Not quite the Game of Thrones-screaming-at-your-television cliffhanger, but it insured that I’ll be back for book two. TJ NICHOLS is the author of the Studies in Demonology series as well as several novellas. Having grown up reading thrillers and fantasy novels, it’s no surprise that mixing danger and magic comes so easily. Writing urban fantasy allows TJ to make sure that evil gets vanquished and the hero gets his man. With two cats acting as supervisors, TJ has gone from designing roads to building worlds and wouldn’t have it any other way. After traveling all over the world and Australia, TJ now lives in Perth, Western Australia. 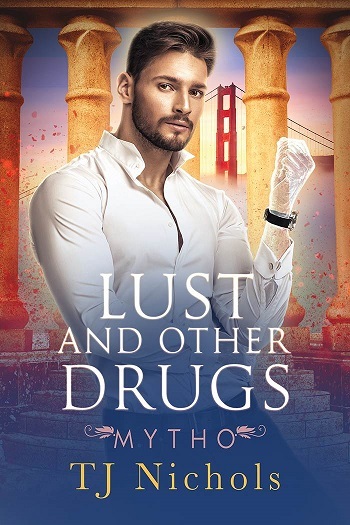 Reviewers on the Wicked Reads Review Team were provided a free copy of Lust and Other Drugs (Mytho #1) by TJ Nichols to read and review.